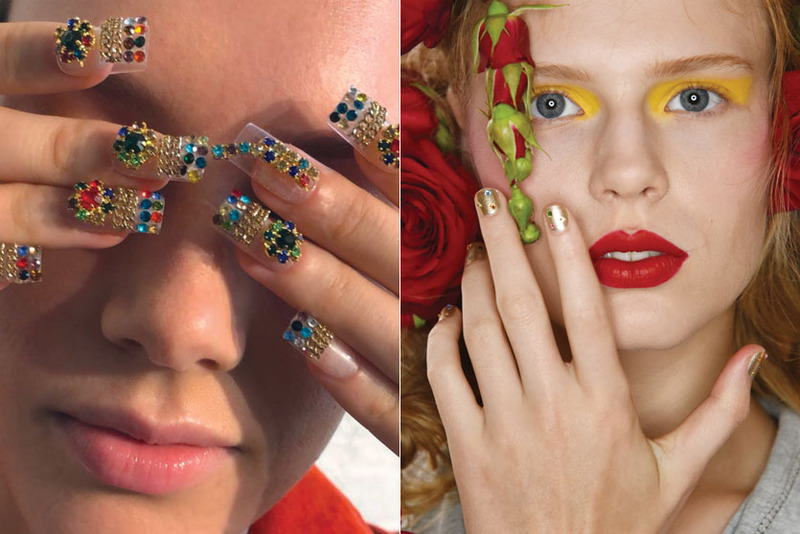 Easy, ornate and somewhere in between: the spectrum of nail art looks that hit this season’s runways produced trends as varied as your clients–and worthy of a place on their tips. 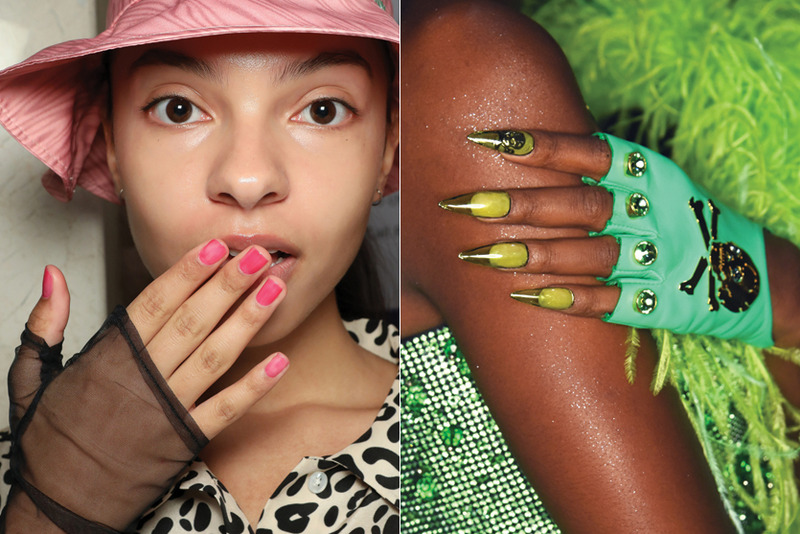 The jelly nail Instagram craze of 2018 found legs on the fashion runway this season, with the lengthiest spotted at the Area show: a Naomi Yasuda-crafted set of squared-off clear tips tinted in green apple, blueberry or watermelon hues. Shorter renditions, seen at Sandy Liang and Maryam Nassir Zadeh, all came from nail lead Holly Falcone. 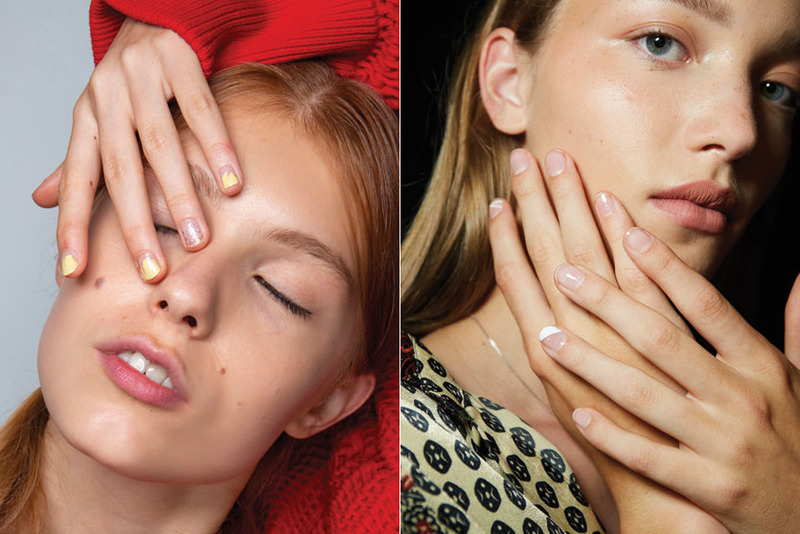 She applied a single coat of Zoya Paris, Lindsey or Alex at Sandy Liang for a sheer wash of color, but her technique for the Maryam Nassir Zadeh show took more than a polish brush to administer. “For the acid-wash, Mediterranean-inspired look, I applied the color using plastic wrap to give it an edgy, watery finish,” says Falcone. Monochromatic palettes aren’t new, but their subtle beauty certainly appeals to clients who dabble in nail art periodically. At Tadashi Shoji, Lust V Cosmetics nail lead Evelyn Lim took the designer’s celestial inspiration and created an otherworldly turquoise-to-navy glitter gradient atop a layer of sapphire Bad Girls Shut It Down. At the Veronica Beard show, Essie nail lead Betina Goldstein eschewed flash in favor of nuance, lacquering long tips with two coats of Really Red followed by a thin arc of bold crimson- pink Bachelorette Bash along the cuticle to create a blink-and- you’ll-miss-it shadow effect. “It’s a little something extra; it makes the nail pop,” confides Goldstein. 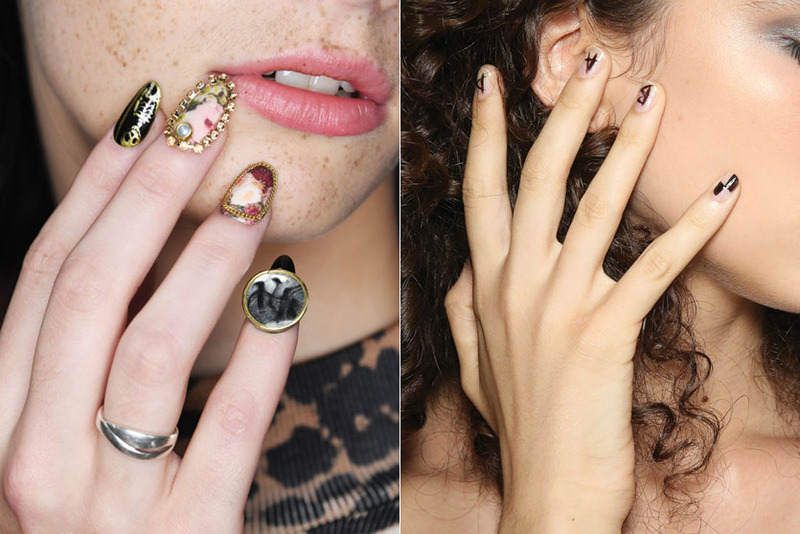 Clean, cool and still a manicure mainstay: Negative-space nail art endures this season as a clear winner. Modernizing the iconic French mani, Essie nail lead Alicia Torello painted a striking black Greek key design across naked tips at Kith. Continuing her naked streak backstage at the Carolina Herrera show, Torello dropped a single dot of Zoya Snow White at the cuticle of each bare nail, citing the design’s elegance in its utter simplicity. Turning the idea of a fresh polish job on its head, nail lead Jin Soon Choi did away with elegance, instead haphazardly painting nails, leaving the edges bare for an intentionally chipped look at Tibi. Feeling a little lost for nail art inspo? Look no further than what your client is wearing! At Opening Ceremony, multiple mani creations took their cues from all forms of adornment, like a rainbow of eye shadow shades or a gingham-print dress. 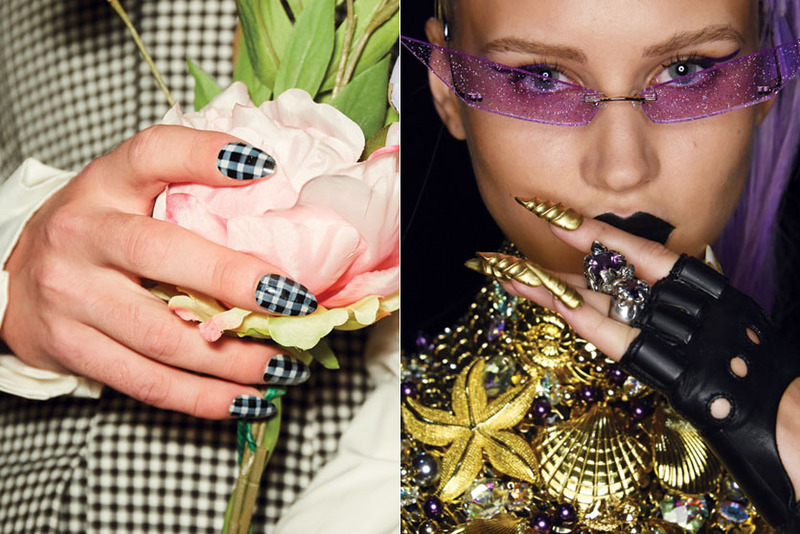 “I wanted to juxtapose the tiny print in the clothes with a magnified version on the nails,” says Essie nail lead Julie Kandalec of her outsized gingham nail art. The Alice + Olivia “Staceface” illustration on a handbag became perfect nail art fodder—so much so that the brand’s designer partnered with Kiss to create a collection of Impress nails boasting the doodle’s oversized sunnies, red lips and black bangs on nail tips. Now that you know the season’s top trends, how do you convert them into revenue? 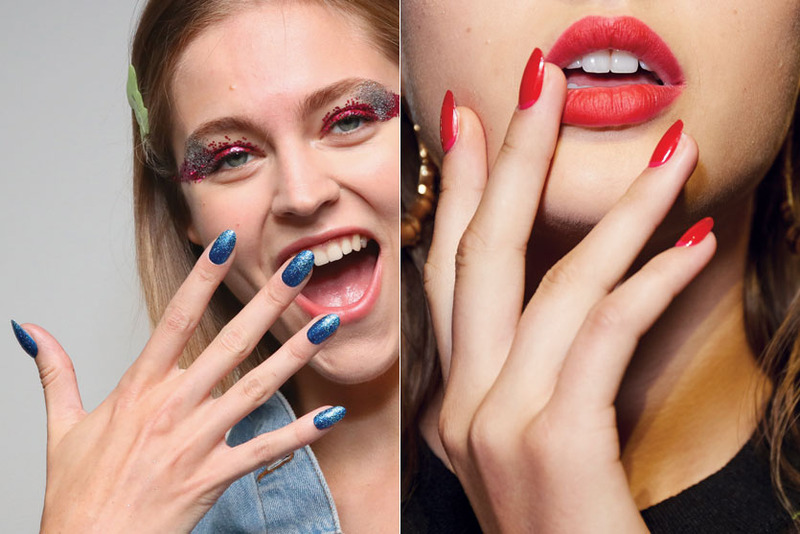 Here, three runway nail leads share their tips for making the most of runway nail art. “Prepare nail samples to showcase your take on the current season’s trends and place them on a board at the front desk. This allows clients to see what’s new, and both the receptionist and techs can upsell by recommending the addition of a trend-specific accent nail. It can be worked into even the busiest of schedules.” —Fleury Rose, New York-based editorial manicurist. “Use a split-screen app (I like Diptic) to show the runway nail look side-by-side with your own version on your Instagram page. Clients forget that nail trends from the runway don’t have to be done identically nor taken literally; they’re simply inspiration to dial up or dial down, depending on the trend and their mood.” —Julie Kandelec, New York-based celebrity manicurist. to recommend the latest colors, styles and patterns in your salon, which in turn, increases client loyalty and trust. It can [even allow you to] elevate your service price. Take what you see on the runway and create your own seasonal styles or salon look book that speaks to your salon and client esthetic.” —Roxanne Valinoti, CND education manager. These two mini-trends may have only shown up twice, but both deserve a spot on your salon’s nail art board. To the Letter: Essie nail lead Alicia Torello painted the letter “K” on thumbs to denote the brand’s name, Kith, while at Nicole Miller, the message was less about the brand moniker and more about its attitude. “I was inspired by the punk graphics from the ’80s that you’d do on your jeans or a bathroom stall,” Zoya nail lead Holly Falcone says of the letters B-A-D she scrawled across several nails.